This little 6-inch x 8-inch book, The Organically Clean Home: 150 Everyday Organic Cleaning Products You Can Make Yourself – The Natural, Chemical-free Way, by Becky Rapinchuk (Clean Mama), completely changed the way that I clean my home. Yes, I already knew that most commercial cleaning products are filled with horrible, toxic ingredients, but I was just plain lazy about creating my own – and cleaners/detergents like Dr. Bronner and Method are not available to me locally. Becky’s book was exactly the inspiration and guidance I needed. The first thing I did was go through the entire book and put sticky notes on every “recipe” I wanted to try. And then I got to work gathering the ingredients I needed. The very first recipe I tried was just about the easiest, too: Lemon Microwave Oven Cleaner – Steam (see the “recipe” below). I was thrilled with the results. Dried-up spots of food came off easily and the inside of the microwave smelled fresh and lemony. I went on to clean my drain with Natural Drain Cleaner and disinfect the washing machine with Regular Washing Machine Cleaner. 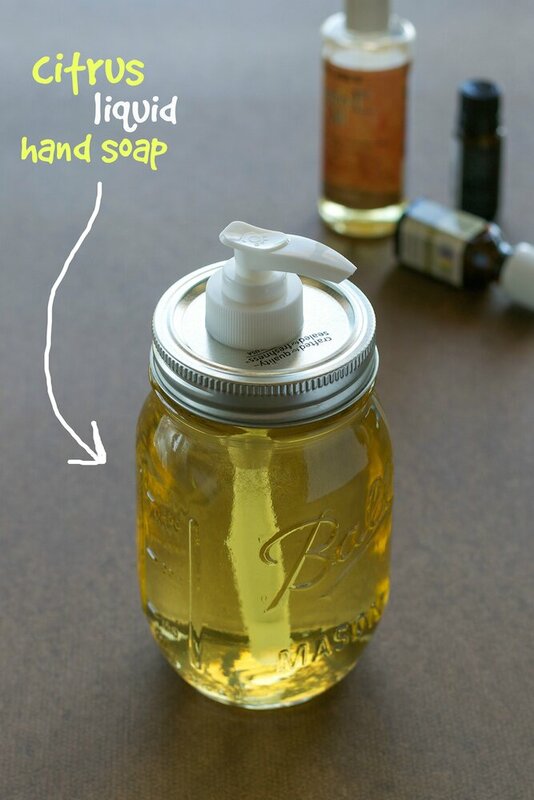 I mixed up a batch of Lemon Peppermint All-Purpose Cleaner, Natural Insect Repellant, Peppermint Daily Shower Cleaner Spray (love this!) and two big mason jars of Citrus Liquid Hand Soap. I have many other recipes marked to try: Lemon Dishwasher Detergent, Oven Cleaner – Paste, Fruit and Veggie Wash, Lemon and Clove Powdered Laundry Soap, and Design-A-Dryer Sheets. The recipes are simple to follow and many of them are customizable to your favorite scents. Becky’s book covers cleaners for the kitchen, bath, laundry room, bedrooms and living areas, floors, the nursery or playroom, garage, basement and garden – and also provides cleaning checklists to help you stay on track. Her introductory chapters guide you through the basics and the benefits of making your own cleaning products and how to build your cleaning “tool kit.” Now for the microwave cleaner recipe! Using steam to clean messes and grease off the interior of a microwave is simple but extremely effective. The best perk is the smell from the juice of the fresh lemon while the microwave cleans itself. To Make: Combine Place water in a microwaveable bowl. Cut the lemon in half and juice it. Add the juice and the lemon halves to the bowl. Run the microwave until the water boils (3–5 minutes). When done, let the mixture sit and steam in the microwave for 15–30 minutes. To Use: Remove the bowl and wipe microwave clean with a clean, damp cloth or sponge. Wipe dry. To Store: This is a one-time-use product; no storage necessary. This cleaning task is mostly hands-off and can easily be done while you’re working on other things in the kitchen. i LOVE using homemade or natural products for cleaning !! I’m a convert for sure! This book will get you going! I’ve made orange oil in the past and I use the lemon microwave cleaner. I love the steam cleaning – amazing how well it works. My social media is limited, but I still need to enter! I have been very DIY oriented lately with things like this!! I LOVE Dr.B stuff, but I want to be even more minimal with my cleaning! I figured this was right up your hiking path, Nature Girl! I already use homemade products, but I certainly don’t have 150!!! Love the microwave idea and am going to lemonize my microwave right after breakfast. The smell of a clean, not chemicalized house is truly wonderful! Becky has one in there for homemade disinfecting wipes – gotta try that one. I don’t make my own cleaning products, but I’ve always wanted to give it a try. Like you, this book would probably get me to finally do it. I’m sure it would! It’s very inspiring and once you smell some of these – you’ll never go back to commercial products. I have just recently started to experiment with vinegar. Vinegar is wonderful and is used quite a lot in this book. I use it to clean my fruits and veggies. Like you, this is something that I keep thinking I’m going to do, but I haven’t quite gotten there! Thanks for the chance to win this book Annie, I think it would get me moving in the right direction. Becky makes it so easy. Thanks for commenting, Terri! You’ll go crazy for this! I absolutely love it. I do make my own bathtub scrub and counter spray, oh and laundry soap too! I could definitely use more ideas though. I also <3 sharing the few things I know with others even when standing in line at the grocery store! This book has a treasure trove of cleaning recipes! I would love to learn how to make my own cleaning products! This is a such a great book, Michelle. Thanks so much for commenting! if you count mixing vinegar and baking soda I do! Definitely a good one to have in one’s home library. Thanks for entering the giveaway! I haven’t made my own cleaning products but I do use vinegar with hot water to clean my windows and my wood floor. Baking soda works well as a paste to clean many things. I could do a lot more – these ideas are fantastic! See – you’ve got a good start!! Yes I make all my own cleaners. Woohoo – way to go! It is fun that you come out with this post cause I’m just starting out doing my own cleaning stuff and comestic products. However, I’m still novice and this book would be a really good one to have. Novice over here, too! I just couldn’t quite get going on my own, and this really helped. Thanks, girl :-)! I have been wanting to make all my own cleaning solutions for a while now, and I’ve finally started to gather recipes together to really start – I hate thinking about all the chemicals I’m spreading around with the store-bought brands. This book sounds amazing! I don’t know why it never really occurred to me that one could make their own products, but it would be tough now to go back to the commercial stuff. Thanks, Maria! Well, good luck in winning a copy, Ashley! And thanks for commenting :-). I make my own deodorant, but I haven’t made my own house cleaning products yet. Sounds like a great resource! I make simple cleaners using various natural ingredients like vinegar, baking soda, and citrus oils, but I’d like to expand my repertoire.